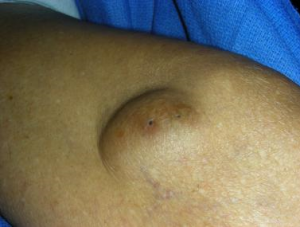 Swelling in an abnormal area of the skin. Sometimes it numerous, but may appear in single number. Painless tumor has many shapes. The cause of skin tumors is not known, but some people may be likely to develop more or less of them based on heredity. Older people may be a cause. Cancer cells grow in the same manner. However, unlike the cells in benign tumors, cancerous cells can invade nearby tissue and spread to other parts of the body. Curettage and electrodesiccation: This involves scraping away the tumor tissues with a sharp surgical instrument called a curette. Surgical excision: This involves cutting into the skin, removing the growth. Most skin lesions are benign; however, some concern has caused the patient to make an inquiry, and a correct analyze is important. The accurate analyze of any skin lesions can be made by histologic examination of a skin biopsy. However, clinicians must gain the clinical acumen to correctly identify common benign skin lesions and to distinguish those skin conditions that do need a biopsy and possible further treatment. So, to confirm the analyze need a consultation.